The U.S. Bureau of Labor Statistics released their monthly inflation data on Tuesday, October 18th and revealed an almost 38% increase in Annual Inflation in September. The annual inflation rate was 1.06% in August and increased 37.7% to 1.46% in September as a result of the Consumer Price Index (CPI-U) increasing from 240.854 to 241.428. For the year meat poultry and fish were down -6.3%, energy was down -2.9%, while Fuel Oil was down a whopping -8.5% and used cars and trucks were down -4.1%. However, Medical care services was up 4.8%, Transportation Services was up 3.0%, Shelter was up 3.4%, and Medical Care Services was up 5.1%. 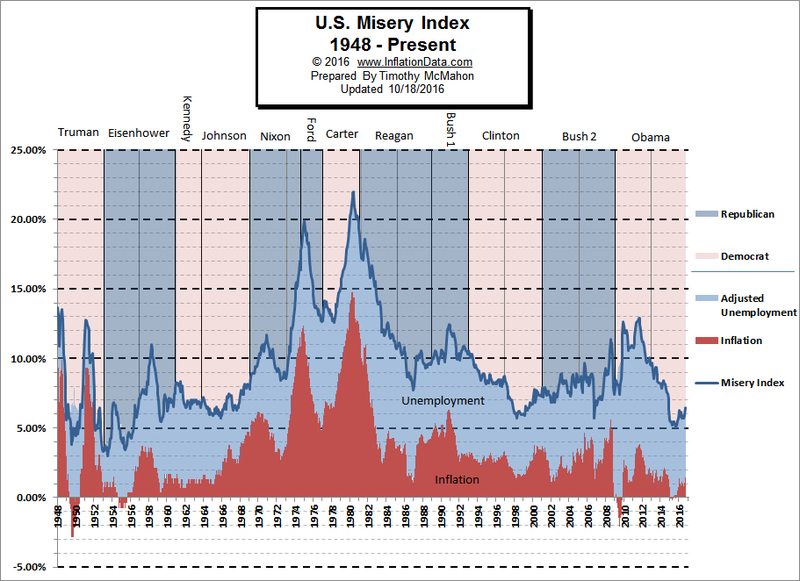 Since both high unemployment and high inflation are major factors to the average wage earner, the misery index is a quick and dirty metric to gauge the health of the economy because as inflation rises the cost of living increases and as unemployment rises more people cross the economic line into poverty. 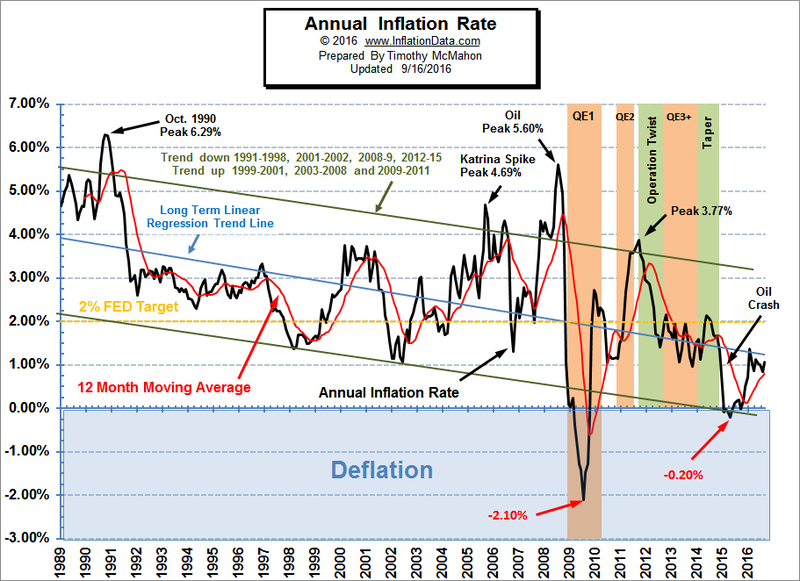 The Moore Inflation Predictor© (MIP) is a highly accurate graphical representation designed to forecast the inflation rate. By watching the turning points, we can profit from inflation hedges (like Gold, Real Estate and Energy Producers) when the inflation rate is trending up and from Bonds when the inflation rate is trending down. Our MIP was projecting an up-move with a maximum of 1.42% , so the actual move was slightly higher than our projection. Monthly inflation was 0.24% for September 2016 replacing a -0.16% for September 2015. This is starting to sound pretty ominous. The Washington War Party is coming unhinged and appears to be leaving no stone unturned when it comes to provoking Putin’s Russia and numerous others. The recent collapse of cooperation in Syria — based on the false claim that Assad and his Russian allies are waging genocide in Aleppo — is only the latest example. careful with taking percentage of a percentage.